What are the most popular dog breeds in the USA right now? According to the American Kennel Club they're a mixed bunch, but every single one of them deserves their spot in the Top 10! The dog breeds at the top end of the popularity stakes often don't change significantly from year to year with the top 20 often simply reshuffling every 12 months. The Labrador Retriever has held the #1 spot in this annual dog popularity contest for twenty-six years. Yes, TWENTY-SEVEN years! Just below are the top ten dogs in the USA for 2017 including a quick overview at the qualities of each breed and what makes them such firm favorites. Below them you'll find the breeds which fill the spots from #11 thru #20 as well as a look at some of the most popular made-in-the-USA dog breeds. This breed's #1 position in the 'Most Popular Dog Breeds' list probably won't come as any great surprise to anyone who's ever met a Lab! They're the quintessential family dog and have been in this number one spot every single year for the past two-and-a-half decades (twenty six years, to be precise). 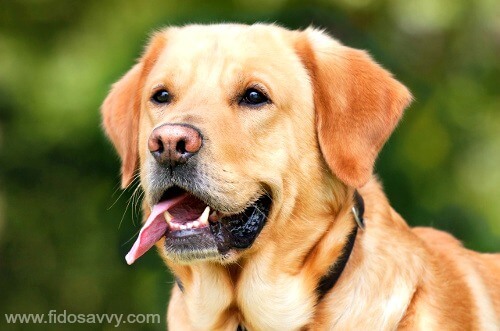 What is it that makes the Labrador Retriever so enduringly popular? There are a whole host of things, the most important one being their wonderfully sunny and friendly personalities, but the undeniable cuteness of roly-poly Lab puppies has got to factor in! 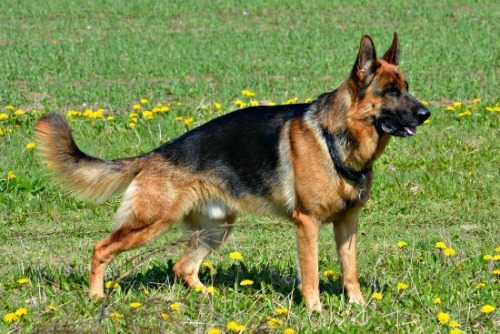 The German Shepherd dog is entirely different from the Lab in just about every way you can think of, and yet it is also consistently among the most popular dogs both here in the US and around th world. Extremely intelligent, hard-working, sturdy and courageous GSD's love to have a job to do and excel in obedience, tracking, search & rescue, drug detection, police work and much more. They also make wonderful family pets. Gentle, affectionate and loyal to the core, German Shepherds will happily accompany 'his' people on almost any outing or activity you can think of, is prepared to protect those that he loves should the situation arise, and yet still enjoys a cuddle on the sofa with mom. 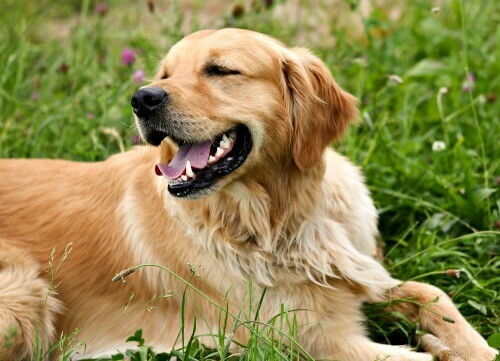 Like it's close 'Retriever relative' the Lab, Golden Retrievers have been counted among the most popular dog breeds in the USA for a L-O-N-G time! Looking remarkably like Labradors, but with a longer, thicker coat that ranges from pale yellow to deep red-gold, this is a happy, laid-back, intelligent dog who loves nothing more than to be part of the family. The biggest drawback to owning a Golden is also one of their best features... their coat. It looks gorgeous when they're wearing it, but not so wonderful when you, (or your home) is. 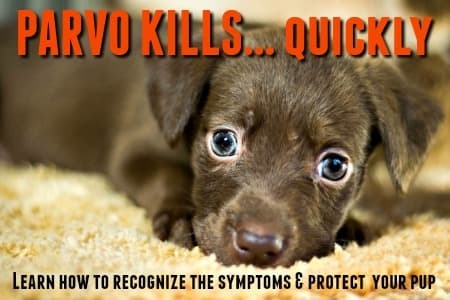 This breed sheds, so be prepared! Playful, smart and irresistible, the French Bulldog breed has worked it's magic on dog-lovers across the country and holding onto one of the coveted Top 10 most popular dog breeds positions. 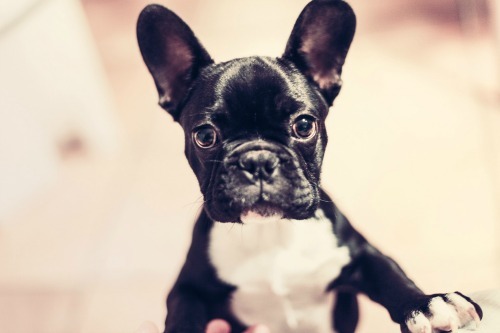 I can personally vouch for the adorable-ness of these short, squishy-faced little dogs, and once you meet a Frenchie he/she is going to capture your heart. As a member of the non-sporting group, these little dogs aren't especially energetic or athletic, but they are sturdy, strong and tenacious... after all, they're bulldogs! If you're looking for a lovable, portable, affectionate smaller breed, the French Bulldog could be a good fit. 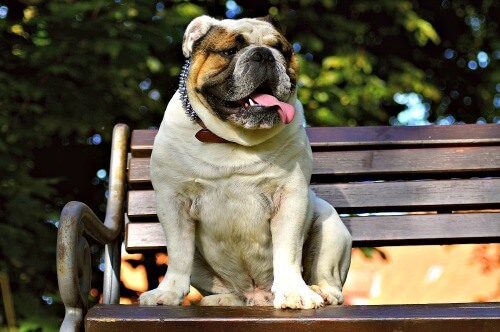 The English Bulldog (aka the British Bulldog or even just the Bulldog) is a breed that has evolved and changed a lot since it was first used as a 'bull-baiter' in England during the 16th century. Today's Bulldog embodies everything that is best about this breed. They're steady, calm, loving and laid-back. Quiet (except when they're snoring!) and low-energy these dogs make the perfect companion for just about anyone. They're fantastic with children and very gentle. Their original aggressive streak - necessary for dealing with huge bulls - has been eradicated, but they do retain a stubborn streak. 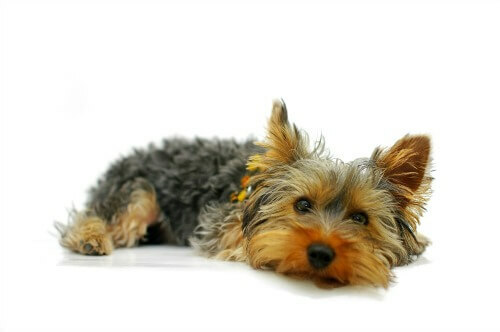 This happy, outgoing little dog has been ranked as one of the USA's top 5 most popular dog breeds for the past 12 years. If you want a bright, lively dog that isn't of the 'teeny-tiny' variety, and is small enough to be portable and sturdy enough to be fun, this breed would make a great choice! 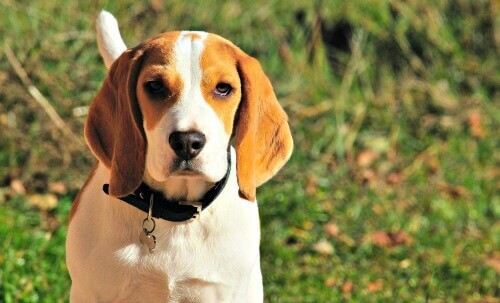 The energy that embodies the Beagle can also be a bit of a challenge.... and this breed has a touch of 'Houdini' in them, so a securely fenced yard, and regular obedience training is a must. 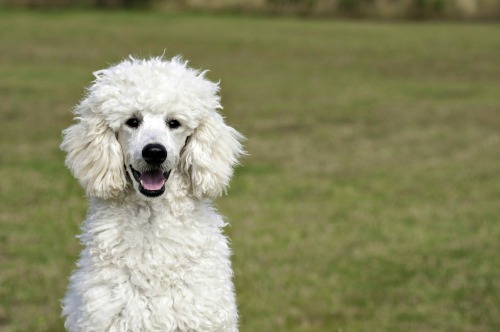 The stylish and intelligent Poodle is a breed that has been around for a very long time! Originally a working dog who braved the cold north European waters to retrieve game, it is now much better known as an excellent competitor in obedience, agility and other activities... and of course, the Miniature and Toy variety are often much-loved lap dogs. They're a sturdy breed who is more rough-and-tumble than they appear, and their brain-power makes them a joy to train and work with. 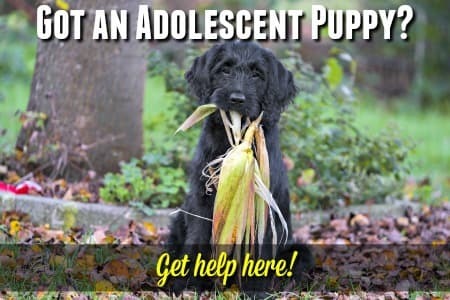 Their coat doesn't shed much at all which makes them a good choice for anyone who suffers from allergies, and many hypoallergenic dog breeds are Poodle hybrids. Of all the popular dogs on this list, the Rottie is my personal favorite! My 6 children have grown up with at least one Rottweiler in the house at all times and I can honestly say they are one of the easiest breeds to train... they're also unbelievably easy to love. Intelligent, strong, self-confident and surprisingly goofy, these big dogs make awesome family pets in the right home. 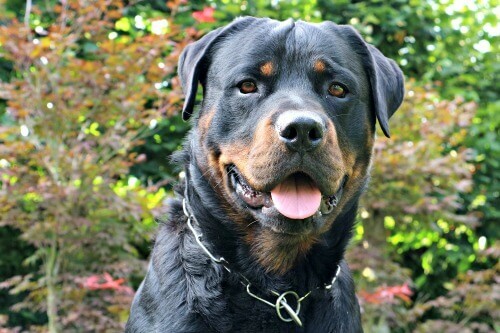 Rottweilers do need lots of love and companionship, plus regular training and socialization but do definitely deserve to be seen for the incredible breed that they are. Once you've met the REAL Rottweiler, you'll be a fan for life. The feisty little Yorkie is a little dog with a huge personality! 100% terrier through and through, these spunky, lively little guys will keep you entertained and on your toes. Originally bred to kill rats and other vermin, the Yorkshire Terrier breed is brave to the point of being fearless and chances are you'll need to protect your pocket-sized pooch from himself a time or two. He won't think twice about taking on the biggest dog at the park! This breed is also very loving and loyal, and they adore curling up on a lap or sleeping under the blankets with you at night. The German Shorthaired Pointer has been slowly climbing the popularity ladder for a few years and enters the Top Ten in 2017 at spot #10. 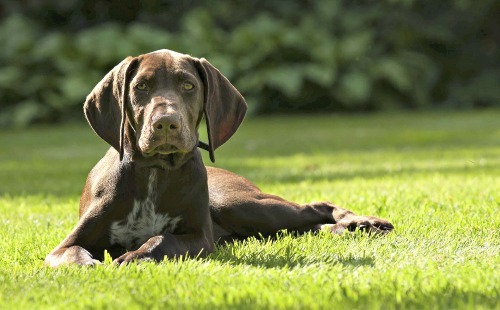 A working breed, the Pointer excels at being a hunting companion and is an intelligent, high-spirited, energetic and athletic dog. This is considered a large breed dog, but with females often weighing in at around 50lbs and males at around 65lbs it is not a huge dog.. which can be a relief to owners as this is a loving and exuberantly affectionate breed. Can be a good family dog if you have an active lifestyle and give him the exercise, training and love he thrives on. If you're wondering what breeds show up just below the top ten, then here's how #'s 11 thru 20 look. 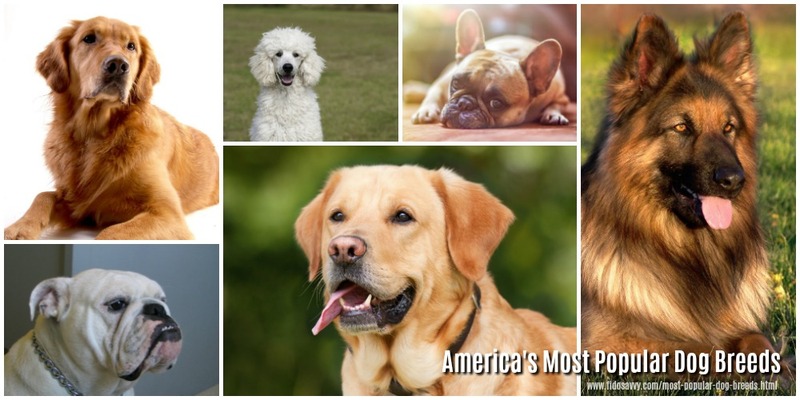 Popular 'Made In The USA' Dog Breeds! The breeds listed above are all hugely popular in the USA, but many of them originated in other countries around the world. The above list is courtesy of Pets Best Insurance, who compiled the information from their extensive customer records for 2014.. Many of these breeds are closely related to European dogs such as the English Cocker Spaniel, bulldogs, terriers and more. Some (such as the Carolina Dog) are native to north America. Regardless of their earliest beginnings, these breeds are now proud to carry the 'Made In The USA' banner and make fantastic pets both here, and around the world. With so many great dog breeds to choose from it can be a challenge to know which one is the best fit for you and your family.